I have a modified Ford Cleveland 351C engine installed which generates, according to the simulation, a bit more than 500HP. Since engine rebuilt I have made now around 1500 miles and have started pushing the engine to higher revs. I have misfiring at 5200 rpm. Yesterday, I checked the fuel pressure at carburetor level (installed is a modified 600 CFM Holley (double pumper) from Bob Competition which is now at 720 CFM). I have a red Holley fuel pump installed which produces at idle slightly more than 6 psi. When pushing the engine I see the pressure dropping by around 1.5 psi. The needle is slight fluctuating, but I tend to conclude that at high engine power the fuel pressure is close or even slightly below 5 psi, which is below the level some people recommend for Holley carburetors and which could be the route cause of my engine misfiring. I was thinking that I should purchase a new more powerful fuel pump. The next bigger size is a blue Holley which comes with a pressure regulator. Do you think it is the right way to go? I’m scared that engine might run too lean at high rev and I could damage the engine. Do you have any advice, recommendations or experience to share? Do you have increased the diameter of the suction hose in the fuel tank and are the fuel lines big enough? I read in a George's post that it's mandatory beyond 400/450 hp. Sig, is ANYTHING as all connected to the +coil post besides the ignition? If there is- like the electric choke hot wire on a Holley carb, it will behave exactly as you describe. It's just like a rev-limiter since any extra device hooked up there subtracts voltage from the ignition circuit and limits the rpms. Use the hot-connection post on the back of a stock alternator if you need a source of 12V- never the coil. Sig it may be helpful to better describe what you mean by misfiring. Is the engine backfiring through the carburetor? Popping out the exhaust pipes? Surging? Hitting a brick wall and incapable of revving higher? Is this happening when you are depressing the accelerator pedal or when you lift-off the accelerator pedal? Does this happen when the car is sitting still (i.e. running in the driveway) or does this only happen when the car is moving? If only when the car is moving, then does this happen in any gear, or only in higher gears? If it's backfiring / sneezing through the carb it could be the old distributor "roll pin" failure. This issue plagued me when I first got my car. I thought the backfiring was a lean condition too, but turned out to be the dizzy. Lots of possibilities... Like the team has said - more info will help us help you. SIG, have you considered valve floating? Some time ago I installed a relay in order to provide a liable 12 Volt connection for the choke, fuel pump and ignition coil/with ballast (all connected to this one relay output). I took the 12 Volt from the starter relay. It provides full battery voltage with all consumers connected. It did when I installed it. Maybe I should crosscheck. When misfiring occurs, I get scarred and immediately remove the foot from the gas pedal. Do not know whether it is a wall or whether engine would rev up higher. - Immediately disengage the clutch, turn off the ignition and stop. If they are white it is a problem of fuel supply ====> checks the suction circuit. To be certain that it is not the ignition system, try to go until the red line on the first or the second gear with primary throttle only, if you succeed there the ignition is not at fault. you said: "The misfiring sounds like a rev limiter.". I experienced the same when reving my engine under load. Car didn't rev. Turned out to be a clogged fuel filter in the primary inlet (the small brass filters inside the holley fuel inlet). Get rid of them, and check your external fuel filter, if any, and your fuel pick up. It very much sounds like engine is not getting enough fuel at high revs and load. If you floor the pedal your secondaries are forced open on you double pumper. If you have a fuel delivery problem it could possibly be that the secondary float bowl struggle to keep full and if the fuel pressure drops at high demand (high rpm) you then obviously have a fuel flow problem. Not enough fuel available at the pump to maintain a stabile pressure or a restriction between the pump and your carbs float valves. Possible causes: Lines/tubes inner diameter to tight, bended/flat hose or pipe, filter clogged, fuel pump failed or improper and of course the supply line in the tank. 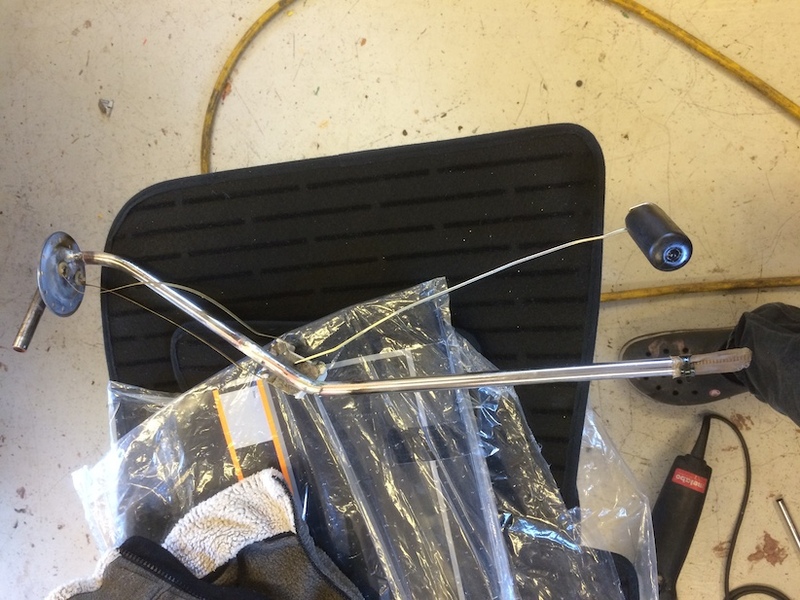 For a larger fuel pump line for above 450 bhp engines, it's possible to replace the late tank sender's fuel line from the small ID stock size to the next size larger (3/8" OD) steel tubing. Above that size you cannot make a tight enough smooth bend in the line to fit under a stock engine screen. Changing fuel-out line size is a real problem if you have an early fuel tank, as that fuel feed's smallest pinch-point is the welded banjo 'out' fitting on top of the early tank. Bigger pumps run into the fuel-out of the tank restriction problem regardless of size, and are noisy. A temporary 1 gallon tank with an electric pump running directly into the carb should allow you to drive at least 10 miles warmed up in 3rd-4th gear under load to see if you really have a fuel pump, tank or fuel line restriction problem. BE CAREFUL! I've always had problems separating ignition & fuel problems- the symptoms are the same. I once worked on a fully 'built' 351-C (like yours) that would not rev above 5200 rpms, and we looked at EVERYTHING! 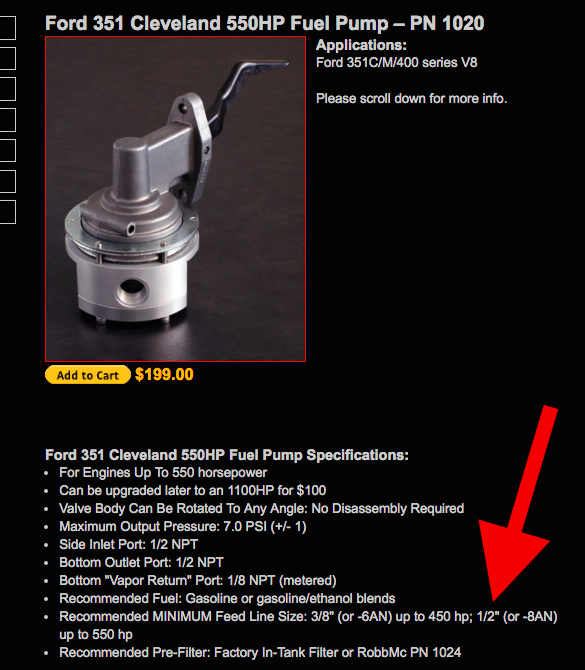 A racing shop finally fixed it- by changing the high pressure oil pump to a std oil pump! NO other changes were done and the thing instantly revved to 7000! Still trying to figure this one out- something to do with the oversized pump's load on the distributor drive, but whatever works is right! I do NOT recommend ANYTHING but a std 351-C oil pump on any wet-sump Cleveland. Photo of fuel sender after I exchanged the supply pipe to a 12mm pipe. Of course properly brazed so it is a permanent solution. And as mentioned it is a challenge with the clearance unless you do as I did and brazed it so it exits the flange already at an angle and about half way down the bend. - In case the fuel line and tank supply pipe are too small then I should see a drop of fuel pressure far more than 1.5 psi, right? Do you know what the minimum fuel pressure for a Holley should be to support 500+ HP? is 4.5 Psi enough, like in my case? When I installed my FITech fuel injection, I took the fuel supply to the pump off the bung in the bottom of the fuel tank. That allows a large line and skips the problem of trying to get a large line in the top of the tank. You could also replace the "roll over thing" in the top of the tank with an adapter and large line. That "roll over thing" in my 73 appeared useless as a fuel blocking device in a roll over since all it was coarse mesh inside and just let the tank breathe. If you replace the "roll over thing", you must be sure you have a gas cap that breathes (vents) both ways. What are sold as venting caps only vent one way. Good advice, Over-50. Hall Pantera sells a real safety roll-over valve and adapter for all Panteras, for less than $50. The valve itself is a production Ford-built part. That rivited-on thing at the top of our fuel tank is only a breather; some 1980-up Panteras have a true factory anti-roll-over valve. It consists of 3 separate parts, is tall and is extremely expensive. I don't like a Christmas-tree of fittings hanging down from the extremely thin steel tank bottom; a few survivors tell of ripping fitting collections out of tanks in a crash, with a resulting fire. So I recommend finding another, safer method of enlarging the fuel feed in Panteras. There are several. For modified fuel systems, I also recommend using an in-tank fuel pump rather than any external pump. I use a stock Ford TBI pump & regulator with carbs, and a Ford EFI pump for injection. They both fit in an unaltered Pantera tank. In-tank pumps will also be much quieter in operation. With early tanks and EFI, the welded feed line is often used as the fuel-return line. Sig, it's not just the fuel pressure, its the volume needed to keep both float bowls full. Empirically, at 6-8 psi (Holley fuel pressure range), it takes a 3/8" or larger OD line all the way from the fuel inlet inside the tank, to the later Holley float bowl needles. With EFI at 55 psi, the stock 5/16" OD line will flow enough to work. TBI runs at about 12 psi and such electric pumps can be regulated down to 6-8 psi for Holley carburetors. But if you try regulating a high-pressure EFI pump down for carb use, the restriction is so large that either some models of e-pump's thermal-reset breaker will trip, then a few minutes later, will reset. Or in other e-pumps, there's an overload wire inside the pump that will burn through. Such pumps are then junk. Ford 12 psi TBI pumps look identical to Ford 55 psi multipoint EFI pumps and may not have markings, so be careful with used or bargain pumps. ...It is My opinion that Your 'Miss' has nothing to do with the Fuel. If it were the fueI, I think You would see problems before 5200 Rpm. I believe the Miss to be 'Spark' Related. Such as a Plug Wire Too Near a 'Grounding Point' (Header) or Cross-Firing to another Plug Wire. Here is what I did to Prove it. In a DARKENED Garage, Lights Off; Have the Decklid Open, Have a partner start the engine and hit a couple of 'Free-Revs', While You observe the Engine running in Total Darkness...You will See Your Miss in the Form of a Blue Arc!! This Test is Very Revealing, Try It. FWIW, I Do NOT Have a Distributor! I run a 'DistributorLESS' Ignition on the Cleveland, Maximum Joules to 10,000 RPM and NO 'Rotor to Cap' ARC GAP! I am also skeptical about it being a fuel issue. Sig, don’t know your setup so I don’t know if this is a possibility. I once installed a new spark box into my race car and “neatened “ up the wiring around the spark box and dizzy. Everything seemed to run fine until I got on it once on the race track. After checking everything I concluded that the new spark box was bad. It felt like the engine was hitting the rev limiter early. We changed the spark box WITHOUT neatening up the wiring and the engine ran without issue. Before the next race I had the new spark box checked and reinstall it WITH neatened wiring. Same thing happened misfiring under load. I went back to the pits and finally realized what I did. Trying to keep everything neat and tidy I mistakenly bundle the signal wires from the dizzy and the wires to the coil for about 12” or so. I separated them and the misfire was gone. A lesson well learned. Can you post a picture and part number of the Ford EFI in-tank pump. Will it fit through the "roll over valve" opening? I might change from mine that comes off the bottom bung if it fits thru the hole and will run my FITech. “Henry – if I’ve told you once, I’ve told you 1000 times - 90% of “carburetor problems” are caused by the ignition! ...Sorry, I can't resist. Most people don't know, that way before George Holleys' First Single Barrel Carburetor; at the Dawn of a Internal Combustion Engine, ever Powering a Four-Wheeled Vehicle....The VERY First 'Carburetor' was a SPONGE! We've come a Long Way, Gentlemen! Sig have you re-adjusted the floats since you received the carb from Bob? Don't remember which Holley you have, but know there are some Holley vac-secondary 4bbls that are made more for emissions than for performance, and they are not necessarily ID-ed as 'emission carbs'. Such Holleys are extremely difficult (or impossible) to tune on a performance 351-C. Double-pumpers are similarly difficult as they ALWAYS run rich. I had one brand new Holley vac-sec on a Pantera in for work, and after weeks, I gave up on getting it to run right and bought a Tuner-Holley with some 18 separate modifications built in. That instantly fixed the problem and yielded better power and added 2 mpg on long trips. May be worth the extra money to you as well. Based on your description above, I think you have mechanical secondaries. You said you had a “double pumper“. Anyway I had a problem with my Holley vacuum secondary carburetor, where the diaphragm the pools in the secondaries was stiff and not opening. That might be something else you want to check, that your secondaries are opening smoothly as you ramp in the power. It might explain why you are having to go so much richer than the primaries. We we made a little flag, and affixed it to the secondary linkage. This let us see that the secondaries we’re sticking. I did not re-adjust the floats only checked the correct fuel level in the bowls. The carburetor is new, secondaries are working smoothly. It is a double pumper Holley and a Tuner-Holley which is from competition carburetion. Found finally the reason for the misfiring. I had a PowerValve 35 installed (in Prim) and replaced it by a 65.